Jazz at the Zoo. January 11, 2002. 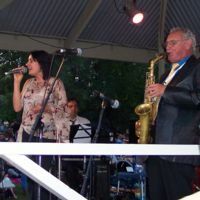 The place was packed with easily more than 4000 people crowded in to the Zoo grounds to hear Don Burrows and Nina Ferro in the Zoo Twilights music program. They were in good form, and a fine night was had by all.